Native American Facts For Kids was written for young people learning about the Mohawks for school or home-schooling reports. We encourage students and teachers to visit our Mohawk language and culture pages for in-depth information about the tribe, but here are our answers to the questions we are most often asked by children, with Mohawk pictures and links we believe are suitable for all ages. Photographs are the property of the sources we have credited. How do you pronounce the word "Mohawk"? What does it mean? Mohawk is pronounced "mo-hawk." It comes from a name their Algonkian enemies used to call them, meaning "man-eaters." In their own language, the Mohawk people call themselves Kanienkehaka, which means "people of the flint." It's not clear anymore whether that name was supposed to be literal, or an insult, or just a figure of speech to show that the Mohawks were fierce. Some Mohawk people believe that in ancient times, before they joined the Iroquois Confederacy, their ancestors used to eat enemies they had killed in battle. Other Mohawks think that never really happened and cannibals were always rare and strange in Mohawk society, like they were in other cultures. Where do the Mohawks live? The Mohawks are original people of New York state. Here is our map of New York Indian tribes and the location of their original home lands. Some Mohawk people still live in New York today, but most Mohawks retreated to Canada in the 1700's. Are the Mohawks Iroquois people? Iroquois wampum belt Yes, the Mohawk Indian tribe was one of the original members of the Iroquois Confederation, or Kanonsionni in their own language ("people of the longhouse.") The other member nations were the the Seneca, the Oneida, the Cayuga, and the Onondaga. Later a sixth tribe, the Tuscarora, joined the confederacy. Today these long-term allies refer to themselves as the Haudenosaunee or Six Nations. How is the Mohawk Indian nation organized? The Mohawk nation had a tribal council chosen by the Mohawk clan mothers (matriarchs, or female leaders.) But the Mohawks were also subject to the decisions made by the Iroquois Great Council. Nine Mohawk chiefs represented their tribe's interests in the Iroquois Council. This is similar to American states which each have their own government, but are all subject to the US government. In fact, the Iroquois Confederacy was one of the examples of representative democracy used as a model by America's founding fathers. Today the Mohawk people have four First Nations in what is now Ontario and Quebec, including one reservation with land on both sides of the Canada-US border. Each of these Mohawk tribes is autonomous, which means the Indians who live there have the right to make their own government and laws. There are also other Mohawk communities in New York and Quebec, and some Mohawk people live on the Six Nations Reserve, which they share with members of the other Iroquois nations. What language do the Mohawks speak? Most Mohawk people speak English today, but some Mohawks also speak their native Mohawk language. Mohawk is a complex language with many sounds that are unlike the sounds in English. If you'd like to know a few easy Mohawk words, "she:kon" (pronounced similar to shay-cone) is a friendly greeting, and "nia:wen" (pronounced similar to nee-ah-wenh) means 'thank you.' You can also read a Mohawk picture glossary here and listen to the spoken language here. What was Mohawk culture like in the past? What is it like now? Mohawk flag Here is the home page of the Mohawk Tribe of Kahnawake, where you can find information about the Mohawk lifestyle past and present. How do Mohawk Indian children live, and what did they do in the past? Mohawk doll They do the same things any children do--play with each other, go to school and help around the house. Many Mohawk children like to go hunting and fishing with their fathers. In the past, Indian kids had more chores and less time to play, just like early colonial children. But Mohawk children did have toys and games. Mohawk girls liked to play with cornhusk dolls, and boys played a game where they tried to throw a dart through a moving hoop. Lacrosse was also a popular sport among Mohawk boys as it was among adult men. Like many Native Americans, Mohawk mothers traditionally carried their babies in cradleboards on their backs. Here is a website with pictures of cradleboards and other Native baby carriers. What were men and women's roles in the Mohawk tribe? Mohawk men were in charge of hunting, trading, and war. Mohawk women were in charge of farming, property, and family. These different roles were reflected in Mohawk government. Mohawk clans were always ruled by women, who made all the land and resource decisions for each clan. But Mohawk chiefs, who made military decisions and trade agreements, were always men. Only men represented the Mohawks at the Iroquois Great Council, but only women voted to determine who the Mohawk representatives would be. Both genders took part in storytelling, artwork and music, and traditional medicine. What were Mohawk homes like in the past? Iroquois longhouse sketch The Mohawk people lived in villages of longhouses, which were large wood-frame buildings covered with sheets of elm bark. One Mohawk house could be a hundred feet long, and an entire clan lived in it--up to 60 people! Here are some pictures of Iroquois longhouses like the ones Mohawk Indians used, and a drawing of what a long house looked like on the inside. Here is a photograph of an Iroquois longhouse, and here is a picture of what a longhouse looked like on the inside. Today, longhouses are only used for ceremonial purposes. The Mohawks live in modern houses and apartment buildings, just like you. What was Mohawk clothing like? Did they wear feather headdresses and face paint? Mohawk Indian moccasins Mohawk men wore breechcloths with leggings. Mohawk women wore wraparound skirts with shorter leggings. Men did not originally wear shirts in Mohawk culture, but women often wore a poncho-like tunic called an overdress. Mohawk Indians usually wore moccasins on their feet. In colonial times, the Mohawks adapted European costume like cloth shirts and blouses, decorating them with beadwork and ribbon applique. 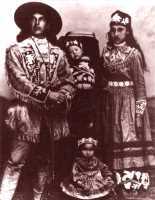 Here is a webpage about traditional Iroquois dress, and some photographs and links about American Indian clothes in general. The Mohawks didn't wear long headdresses like the Sioux. Mohawk men wore traditional Iroquois headdresses, which are feathered caps with a different insignia for each tribe. (The Mohawk headdress has three eagle feathers on top.) Mohawk women sometimes wore special beaded tiaras. In times of war, Mohawk men shaved their heads except for a scalplock or a crest down the center of their head--the hairstyle known as a roach or a "Mohawk." Sometimes they augmented this haircut with splayed feathers or artificial roaches made of brightly dyed porcupine and deer hair. Here are some pictures of these different kinds of Indian headdresses. Mohawk women only cut their hair when they were in mourning. Otherwise they wore their hair long and loose or plaited into a long braid. Here is a website with pictures of Indian women's hair. Men sometimes decorated their faces and bodies with tattoo art, but Mohawk women generally didn't paint or tattoo themselves. Today, some Mohawk people still wear moccasins or a beaded shirt, but they wear modern clothes like jeans instead of breechcloths... and they only wear feathers in their hair on special occasions like a dance. What was Mohawk transportation like in the days before cars? Did they paddle canoes? Iroquois snowshoes Yes, there were two types of Mohawk canoes. A canoe made from elm bark was light and fast. A dugout canoe, made from hollowed-out logs, was long and could carry many people. Here is a website with pictures of different Native American canoe types. Over land, the Mohawks used dogs as pack animals. (There were no horses in North America until colonists brought them over from Europe.) During the winter the Mohawks used sleds and laced snowshoes to travel through the snow. What was Mohawk food like in the days before supermarkets? Iroquois farmers The Mohawk Indians were farming people. Mohawk women planted crops of corn, beans, and squash and harvested wild berries and herbs. Mohawk men hunted for deer and elk and fished in the rivers. Traditional Mohawk foods included cornbread, soups, and stews, which they cooked on stone hearths. Here is a website with more information about Native American food sources. What were Mohawk weapons, tools, and artifacts like in the past? Iroquois war club Mohawk hunters used bows and arrows. Mohawk fishermen used spears and fishing poles. In war, Mohawk men used their bows and arrows or fought with clubs, spears and shields. Here is a website with photos of Native American weapons. Other important tools used by the Mohawks included stone adzes (hand axes for woodworking), flint knives for skinning animals, and wooden hoes for farming. 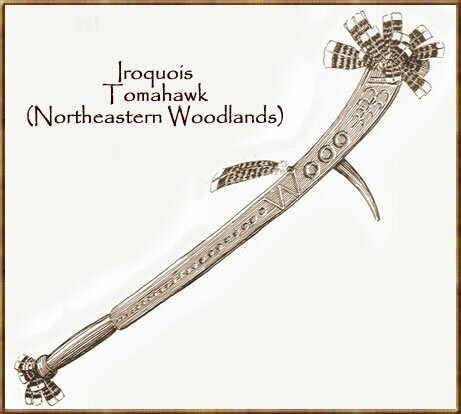 The Mohawks and other Iroquois were skilled woodworkers, steaming wood so that it could be bent to make curved tools. Some Iroquois artisans still make lacrosse sticks this way today. What are Mohawk arts and crafts like? Iroquois beadwork The Mohawk and other Iroquois tribes were known for their mask carving, which is considered such a sacred art form that outsiders are still not permitted to view many of these masks. Iroquois beadwork and the more demanding porcupine quillwork are more common Mohawk crafts. The Mohawks also crafted wampum out of white and purple shell beads. Wampum beads were traded as a kind of currency, but they were more culturally important as an art material. The designs and pictures on wampum belts often told a story or represented a person's family. What was Mohawk music like? Iroquois water drum The two most important Mohawk instruments are drums and flutes. Iroquois drums were often filled with water to give them a distinctive sound different from the drums of other tribes. 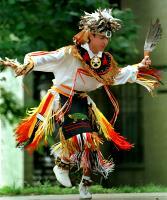 Most Mohawk music is very rhythmic and consists mostly of drumming and lively singing. Flutes were used to woo women in the Mohawk tribe. A young Mohawk man would play beautiful flute music outside his girlfriend's longhouse at night to show her he was thinking about her. What other Native Americans did the Mohawk tribe interact with? The most important neighbors of the Mohawk tribe were the other Iroquois nations: the Seneca, Onondaga, Oneida, and Cayuga. Before the Iroquois Confederacy the Mohawks sometimes fought with the other Iroquois tribes, but once the alliance was formed they were loyal to each other. The Mohawks were fierce warriors who fought wars with the other eastern tribes, particularly the Wabanaki tribes, the Algonquin and Ojibway, and the Mohican bands. The Mohawks also traded with their neighbors, exchanging corn and woodcrafts for furs and quahog shells. What kinds of stories do the Mohawks tell? There are lots of traditional Mohawk legends and fairy tales. Storytelling is very important to the Mohawk Indian culture. Here is a Mohawk story about the origin of the Rabbit Dance. 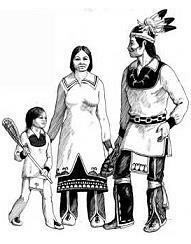 Here's a website where you can read more about Iroquois Indian legends. Religions are too complicated and culturally sensitive to describe appropriately in only a few simple sentences, and we strongly want to avoid misleading anybody. You can visit this site to learn more about Iroquois beliefs or this site about Native beliefs in general. One book about the Mohawk tribe for young readers is The Mohawk Tribe of North America, which has many photographs about traditional and contemporary Mohawk life. Lacrosse: The National Game of the Iroquois is a lively look at this traditional sport and Iroquois culture in general, tracing the lives of three generations of Iroquois lacrosse players. Legends of the Iroquois is a good collection of traditional Six Nations stories by a Mohawk author. Wampum Belts of the Iroquois is an interesting look at the symbols and meaning of the different wampum belt designs used by the Mohawk and other Iroquois peoples. Or If You Lived With The Iroquois provides a good look at daily life in the Iroquois tribes in the old days. You can also browse through our reading list of recommended American Indian books in general. Thanks for your interest in the Mohawk Indian people and their language! An overview of the Mohawk Native American tribe, their language and history. Short vocabulary of Mohawk Indian words. Related links about the Mohawk tribe past and present. Information and links about the Iroquois League.